2015: I have a privileged life, granted I don't own a yacht or a fancy car but I am under no illusions that it is a life of luxury. If I can take a little time out of my selfish existence to benefit those less fortunate than myself then I will always jump at the chance. Thank you TEECH for giving me this opportunity. 2017: This was my fifth summer project with TEECH. I believe the work that they do is fantastic and to see the benefit it provided and the gratitude of the local communities first hand is a priceless experience. What was your role in the project and what did it involve? On this occasion I was very privileged to be given the role of project manager. This involved ensuring that each of the project teams were adequately supported and that we had solid communication and cooperation. Most of this was achieved by a daily briefing to highlight progress and challenges and regular verbal updates during each working day. I also had a lot of hands on involvement, mostly with the external drainage work and the flooring, pointing and painting etc. What were the highlights? It may sound a little silly but putting the onion (septic tank) in the ground manually. We had a load of the team around holding on to cargo straps and planks whilst others walked this huge thing towards a cavernous pit. Nailing the operation bang on first time was awesome and a lot of fun. It is always the little things that I enjoy the most. Absolutely,no doubt.....there is a lot of work to do out there and I need to play my part. You won't understand the magic until you experience it yourself. TEECH, the little charity with the biggest heart. Thank you once again for leaving me tired, exhausted, starving and endlessly happy. ​Would I recommend the charity to a friend? Yes and I do this every day, EVERY DAY. Lee's sister in law Lorraine joined him for the 2016 trip. Lee's girlfriend Kim joined him for the 2017 trip. Both ladies worked extremely hard on the project. In January, following a rather disappointing New Years Eve fortune cookie prediction saying "you will not get a parking ticket this year" (which considering I neither drive not own a car was odds-on to come true), I decided I needed to step outside my comfort zone and try something new this year. When a BT volunteering link dropped into my inbox with a request for enthusiastic volunteers asking 'would you spend 2 weeks in Moldova' I thought "why wouldn't I", quickly followed by a google search to check where it is first and what they wanted me to do! Michelle joined TEECH for the two week project trip to Ivancea and pulled together a power point slide pack to explain the trip from her eyes which can be viewed from the download below. ​Please note that everyone is welcome on a TEECH trip regardless of who you work for! ​I volunteered to make a difference. I wanted to be there, get stuck in and do something worthwhile. 2016 was my first trip and I would love to go again. This was and is an opportunity to help those who need it most. It was also an amazing way to see something grow from start to finish. What better way to meet new people and make life long friends. 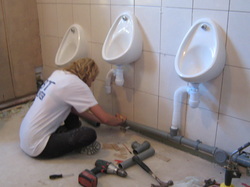 Everyone on the trip had one goal in mind, to get the job done for the children of the school. We were all equal and there to help. I wanted to see and learn about a new culture. I have heard about the hardships the people in Moldova are facing everyday but needed to see it for myself. To make a difference for one persons health, sanity or just way of life would have been great but to have the opportunity to help hundreds was AMAZING! Dave returned in 2017: Family. That’s the best way I can describe my reason. Our TEECH family makes you feel wanted, engaged, worthwhile and at home. What our small group accomplish in such a short time period is inspiring. We all put others first and make a massive difference. Just try and stop me coming again. ​What was your role in the project and what did it involve? 2016: My role was general dogs body, humper and dumper. I was part of the external dig crew from the start but found myself helping in every area available. I moved a lot of stock from Gym to Shop, shop security :-), painted, sanded, drilled, dug, put up partitions, pumped up footballs, distributed aid on and off site, cleaned, sawed, hammered, unloaded lorries, loaded lorries, made people laugh, toilet buddy, provided some 'banging tunes' for the coach journey and generally helped whoever needed me. 2017: I led the shop. Sounds easy but when you have tonnes of aid to distribute to multiple locations it gets tricky. Luckily I had the BEST team working with me and together we smashed it. We unloaded, separated, sorted, stored and distributed. We set up stores and shop away from main project, ran a free-shop for locals (crowd control was very important), we crossed numerous language barriers and got people what they needed to better themselves and the lives of their families. I attended various trips distributing walking frames, wheelchairs, food and much more to other project sites. It gave me an insight into how people live and what a difference we make. Heart-warming and upsetting at the same time. Very worthwhile job and couldn’t have been accomplished without such an amazing team. Meeting so many like-minded amazing people was deffo a highlight. Seeing 4 empty shells gradually grow into what I can only describe as professional amazingness, filled us all with pride. Meeting the people and children of Moldova and seeing what a difference we can make. The winery... WOW! It was great to taste the gorgeous wines this tiny country produces but the highlight of the trip was learning about the history and restraints the winerys are under. When Russia ceased trade these miles and miles of underground tunnels filled with beautiful products was left alone. No one to sell too meant manufacture and distribution came to a halt. Great to see how they are starting to overcome this issue and getting back on track. Thinking about it there was a low point for me. Well, I guess you could call it a low point. We went on a trip to see a local hospital for men, women and children who suffered with depression and schizophrenia. This place was supposed to be a haven for them, somewhere they could get better and get the help they needed. The problem was it was heart breaking for me to see. We only got to see 1 ward which housed 72 men but only had 52 beds. The people showing us round explained how things had got better since Teech were last there. They were using our beds, covers and mattresses but I was still shocked at the conditions. It was there it hit home that even though we were putting in 100% and bring a lorry full of aid and help, it was only scratching the surface of the real problem. I was down and upset that I couldn't do more, that our civilisation couldn't do more. Its like the majority of us have blinkers on. Until you actually see it, you don't believe it or want to believe it. Good news is I got over my slump with a bit of time out and a great chat from one of our 'elder statesmen' Cookie. He let me know we are doing good and we should be proud of our achievements. 290 children will have toilets, clean hands and privacy which they have never had before. Every little nut, bolt, toilet, smile or idea of how to improve lives is worthwhile. I really appreciated his view which makes this low point into a fantastic experience. I went in 2010 and loved it. Someone in the office said TEECH needed a driver and I thought why not. It was a life changing trip. I often describe it as a cross between Big Brother, Top Gear and DIY SOS. 'Stores'. 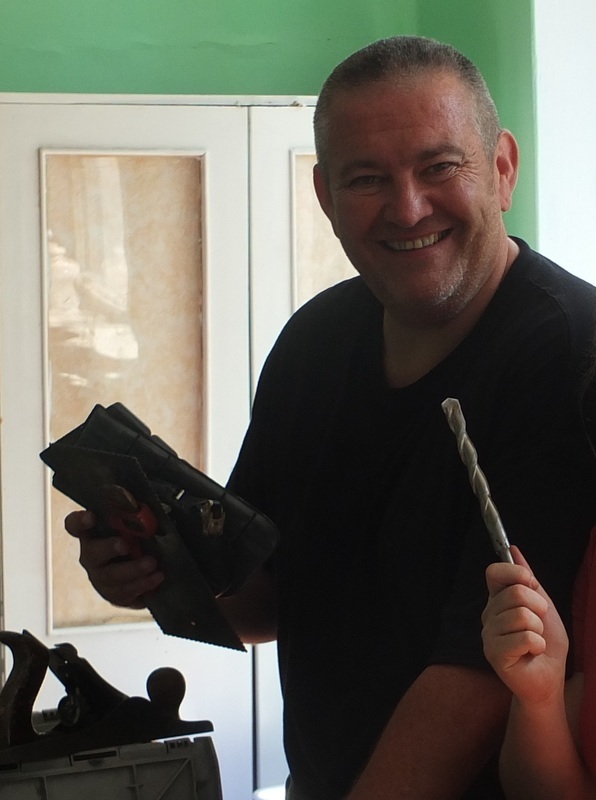 I am not a tradesman by any stretch of the imagination so my role was running and organising the tool stores to start with. Then I was really involved in the 'Free Shop' both stocking and running it on the 3 occasions it was open. I also was in the team that made up all the aid parcels for the local villages. Team moral was another role :) also an older member of the team for the younger ones to ask questions of or share any worries or issues with. I have met some incredible people. By nature groups are formed of like minded people and the little 'gang' we made will be friends for life. Other highlights were seeing the project come to fruition, and the team working to get it finished early. The people of Moldova were very friendly and the event they put on for us for wonderful. ​Would I do it again? Yes I would. Met great people first time and again this time. I enjoyed this one more because I went with friends and made more. There wasn't really any apart from saying goodbye to the people I had got close to at Chelmsford. The coach journey is LONG but you need it to bond on the way out. The toilets take some getting used to! Seeing the faces of the kids and parents when I handed over the school bags to the individual kids from the class lists. So many of the kids were crying and it was out of complete gratitude. Another highlight was meeting so many new people both from UK and Europe and I've made so many friends who I'll keep in contact with. Volunteered for the first time to step outside my comfort zone and really wanted the opportunity to make a difference to people less fortunate than us but actually see the work being put into practice and get involved. I honestly felt a bit lost at the start because everyone had an allocated role/trade and it took a while for me to proactively get involved with the tradesmen/manual graft but I'll know for next time to just get stuck in and offer my help with anyone on any task. One of the guys who took me under their wing for one of the days which I enjoyed because I got to climb ladders, drill holes and dig etc. I spent time in 'shop', helping unpack all the aid boxes for village deliveries (donating clothing to the families) plus I got stuck into some painting. 100% YES. I feel that if I didn’t go next year i'd be really missing out on something so great. ​There is an obvious major impact TEECH’s summer project has on infrastructure: Schools get an indoor bathroom, hospitals get important modern resources, community institutions have aid to help distribute. Since the team is working hard in Great Britain most of the time and donors are observing from afar, I worry sometimes they may miss the smaller-seeming, daily impact they’re having. 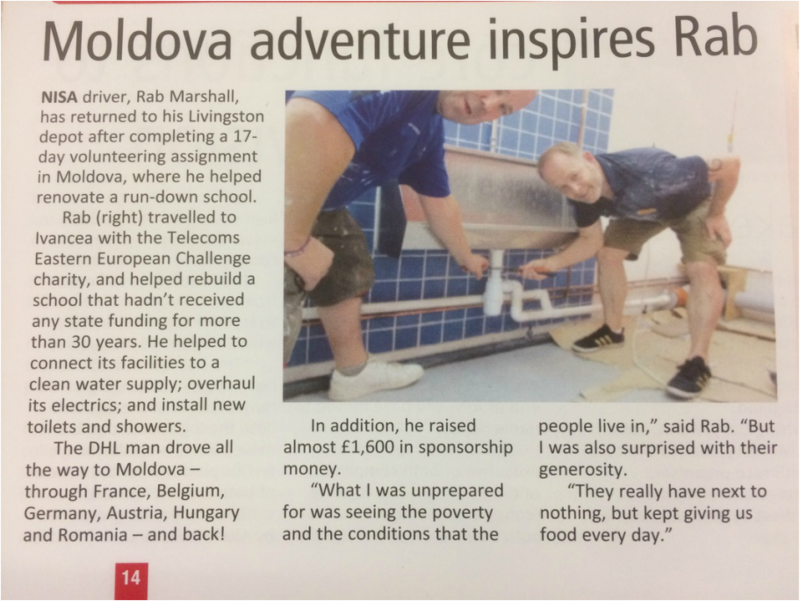 As a volunteer living full-time in Moldova since June 2015, I can attest to how the work TEECH does changes daily life for the better in the communities they work with. Students and teachers are healthier, happier, safer, and have a new source of pride in their community. Students are best able to focus on learning when they’re in this environment, when they’re healthy more often. Girls are better able to attend school after starting puberty - having fuller access to their right to education - because of the privacy and resources the new bathrooms provide. The TEECH team works alongside community members to achieve their projects, helping build both competence in project work as well as confidence that positive change is possible. Community members have a well-deserved sense of ownership in the results because they are so involved in the process. By being a part of a life-changing solution, people who work with TEECH are able to say “yes, I can do this! This can be better!” when they identify other issues they’d like to address in the community. The importance of this self-confidence is immeasurable – it empowers communities to continue improving on their own terms and by their own doing. ​From my perspective, TEECH is doing some of the best, most sustainable aid work I see happening in the country. I’m a US Peace Corps Volunteer and our emphasis is on sustainable development while doing cultural exchange. I was lucky to meet TEECH team members during their aid trip in winter 2015/16. Learning about how they worked from other Volunteers, I quickly recognized that this organization is quietly doing great work with communities. I was honored to volunteer with the group for several days during the summer 2016 project in Ivancea – it was truly the highlight of my summer – and reconnect during their most recent winter trip. Through the network of TEECH volunteers, students I work with are now participating in a pen-friend exchange with a school in Sunderland. I am excitedly looking forward to volunteering with this summer’s project in Sturzeni! I greatly appreciate TEECH for the life-changing work they do with communities here and for being a model of effective development work. I am grateful to all who make it possible! Tom, Northants, 2015 Project : The most rewarding fun you'll ever have, its worth going for the experience. The TEECH trips are not just open to BT staff so if you know someone who would be interested or you think they'd benefit from the experience get them to check it out. I'm another privileged BT colleague who attended this years challenge. If you can spare just two weeks in the summer to go, do it. It is so rewarding, something everyone should experience. I began my apprenticeship with BT Openreach in September 2014 and was introduced to the TEECH charity after an e-mail was forwarded to me. After looking into the e-mail and finding the TEECH website I quickly realised that the project was something I would like to get involved in. During my time on the project I worked doing basic labour and gave a helping hand whenever needed. 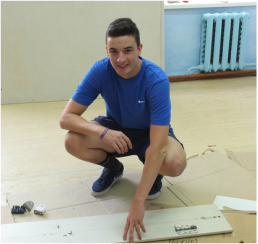 The project introduced me to number of new skills and I learnt a lot of things I never thought I would even do for example putting lino on floors, tiling, and one day I was lucky enough to deliver aid to a number of hospitals. Meeting a great bunch of people from different backgrounds all coming together to complete a worthwhile project. Seeing some of the conditions in parts of the country including the mental hospital we visited in Balti and the original toilets which were used by the children at the school but knowing we were there helping to improve these conditions did prove that our time there is very worthwhile. I felt very welcome from the minute I got onto the bus! I would definitely recommend the project to anyone who was thinking about getting involved. TEECH Sweden has now been set up by Jonathan along with Susanne and Samir. There first overland trip from Sweden was in August 2017 to bring aid to Moldova and also work on the project. I was looking for a worthwhile project where I could contribute with my driving skills and came across the TEECH website which appealed to me instantly. 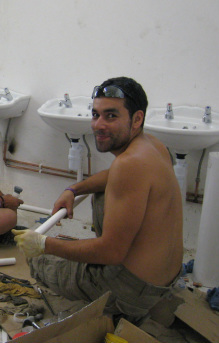 Plumbing - mainly involved being the assistant of one of the more experienced plumbers. I really enjoyed doing this and learned a great deal from Kev and Cookie. Driving on the Romanian mountain roads.Interacting with the locals. Would I recommend the charity to a friend? Volunteering for TEECH was one of the most meaningful and enriching experiences of my life. To try something new, give something back, meet new people, make a difference. It varied - painting, plumbing, laying lino, digging....anything I wanted to try. I liked that I had the opportunity to get involved in different things, and felt I directly contributed to the project. It was also great meeting different people of different ages from all walks of life. I would definitely consider coming on another TEECH trip, however the long coach journey may mean I would choose another volunteer project where I feel I'm spending my time adding more value. It is something I have always wanted to do. TEECH has been a big part of my dads life for so long now and I have heard many stories about the good things that the charity has done for people. I was mainly involved in the Carpentry but had volunteered as a driver as well, so the fun began for me before I had even left the country. The drive there was tiring but brilliant. I found it very settling that everybody seemed to get on with each other and help out where ever needed. I was quite concerned when the local shop ran out of beer but a delivery from the local Mayor sorted that out. If and when I am able to commit to it again I will not hesitate to volunteer. I really enjoyed the last two trips and felt that I really couldn't miss out on this one. I've seen that there's a lot that can be done to help countries like Moldova and even though I don't have a skill as many others do I wanted to come and do my bit, whatever that may have entailed. My main role was being part of the painting team. This involved me joining a team of painters and pretty much paint by numbers job. We were filling in the drawings that Amy drew. It was great fun working with the team and we could put our own stamp on most of the murals by choosing the colours that we wanted. The whole was a highlight, but to narrow it down I'd have to say the village was my highlight. Every year the people I meet seem to be more and more generous. For people that don't have much they sure like to give you the world. Everyday we had people turing up with food and wine. They wanted to take us out and show off their village which I find really inspiring. It's great to see people really proud of where they live. One night in particular stands out to me. This was the concert night where the villagers had worked really hard to put together a performance to welcome and thank us for visiting their villlage. It was a great night filled with music and dancing... and also a lot of sweet on my part. Moldavian's really can dance us under the table!! Some parts of the trip were difficult. These were more to do with the conditions the people live in. One day I went with a few other volunteers to visit an old ladies home. This was such a great experience and one of the great reasons why I find volunteering with TEECH so rewarding. I got to spend some time with the ladies and although it was lovely to see they had a clean place to stay it was also very sad to hear their stories. Many didn't hear from their family and some had turned up with nothing, no clothes, no money , NOTHING. I would certainly do the trip again. I've never found their to be much to improve with the charity. Many things on the trip are really hard to plan as so many things can change. I find that if anything does happen that changes the plan then things are quickly dealt with. This shows just how great the team are that organise the trip. I have always recommended the charity and will continue to spread the world about the great work TEECH do!! I am always looking for new challenges and enjoy driving lorries. Primary role was driver. On site I spent most of the time with the joiners. Helping to :- Make good the floor with wood and concrete, Create new doorway for boys toilet/ shower room, install stud walls, install toilet partitions, lay lino. Additional role (in the Royal Navy I was taught never to volunteer, I had clearly forgotten, but it was a long time ago) I ensured that those disgusting toilets (the ones the children of the school experience everyday outside) were cleaned each morning. The Sunday evening concert and dance. Those going around in a circle dances are more complicated than they looked and I never did fully understand that one where you had to pick up a hanky and get a kiss. Mayor Damian saying 'What have you done to my village, 'Everyone is so happy'. It was brilliant how quickly we all became like one big happy family and all looked after each other. On the last night, with a number of others, had worked through until about 05.15 am finishing various tasks and helping with the final loading of the 18 tonner so pleased that against what had seemed a day earlier an impossible deadline all was complete. After everyone had got on the coach and we were about to leave, I decided to go and have one last look at what we had done. Everything looked so perfect but I think it was the surprise sight of the little final touches of shower gel in the shower rooms and the colourful sponges behind each of the sinks that caused me to shed a tear or two. An unforgettable moment. On the Monday night, I finished work at around midnight (the 3rd time that I had worked really late) and went to bed thinking that we had no chance of getting even close to completing the project before we would have to leave. It was so disappointing. I was part of the electrical team, this role involved fixing and fitting electrical components and wires. Also fitting the trunking to keep the wires safe. There were so many highlights, with this being my first of hopefully many TEECH trips, everybody made me feel welcome to the team and at no point did I feel left out. During the project I learnt loads about electrical principles, there was no such thing as a stupid question on the team and support was always available. The football match was a big highlight for me, proving that the trip was not all work and were able to relax and enjoy the experience. The only low point for me was having to leave. I am awaiting the information for next years trip. I have already mentioned to friends how much I enjoyed the trip and invited them to join me next year.